Cameron Powell has always struggled with goodbyes. On the day his marriage ends, he finds out his mother's cancer has returned-and this time there may be no escape. Faced with the prospect of more chemo and surgery, his German-born mother, Inge, vows to conquer a 500-mile trek across Spain, and Cameron pushes aside his fears to walk by her side. Joined by a misfit band of adventurers - a politically incorrect Spaniard, a theatrical Frenchwoman, a teenager who's never been far from home - Cameron and Inge write a fierce and funny travelogue about the rocky heights and hidden valleys of the Camino de Santiago. But the hardest stretch comes three years later, when Inge's health declines -- and Cameron, ready or not, must accept the challenge to remain as present to his mother as he can. As their journey shrinks to the room around a hospice bed, Cameron begins to record, in their blog, his real-time impressions of life's most difficult voyage. The result is one of literature's "epic love letters" (Julia Scheeres, Jesus Land: A Memoir). Propelled by the searing immediacy of his own fear and sadness, this deeply-felt memoir opens up new insight into what it means to be a man, and takes us - with wisdom, humor, and an overflowing tenderness - into one of the most challenging journeys true friends can ever take. 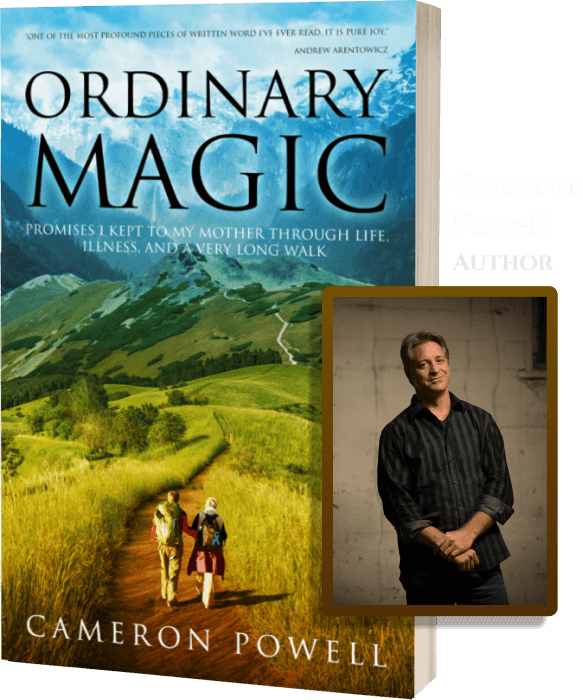 If you like candid mother-son relationships, humorous tales from the trail, and in-the-moment insights on living a life of purpose, then you'll love Cameron Powell's inspirational true story about pilgrimage, presence, and letting go. As his mother lays dying, Powell writes, in real-time, in the voice of a man seized by emotions previously unknown to him. Ordinary Magic breathes profound life into the crucial questions posed by works like Atul Gawande’s Being Mortal – on how to live, die, and be there for others, meaningfully. When time is running out, what does it mean to be a warrior? What does it mean to show up for those we love? 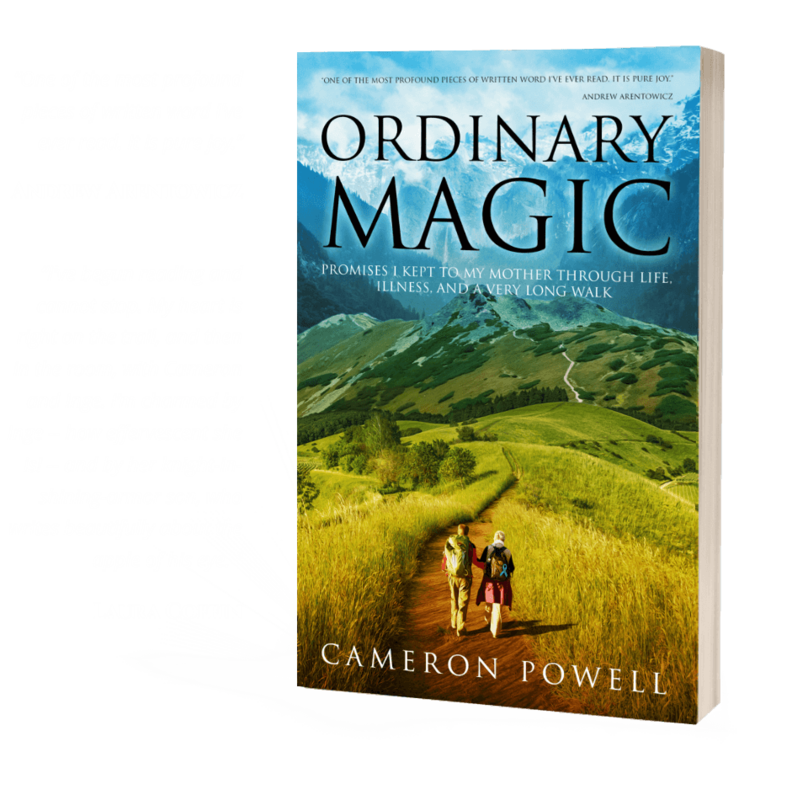 Ordinary Magic is an inspiring true story of the resilience available to all of us, and a meditation on the power and practice of love. "The most painfully honest and therefore true thing I have read in a long while." "Beautiful beyond words how Powell expresses everything, how strong and courageous he and his mother both are. How in awe I am of them both, how very much I love and admire Inge. This is a loving gift. " "Riveting and beautiful - this story needs to be out in the world." "I've begun reading and cannot stop. My heart is right on the trail, and then in the room, with Cameron and Inge. I’m charmed by Inge -- how effervescent she is! -- and by her knight-in-shining-armor son, who writes beautifully about the apple of his eye." “Beautiful, funny, adventurous, at times sad, vulnerable, and very human. It's a story of hope, strength, self-reflection, and inspiration. A story of a woman determined to fight cancer while making a pilgrimage across northern Spain. "A story of walking long distances, through beautiful landscapes, trying unique foods, and enjoying a great camaraderie. And it's a story of love between a Mother and a Son, who accompanied her on her Camino." Some people die without ever having really lived. The end of the Camino: Inge reaches the famous cathedral in Santiago de Compostela. 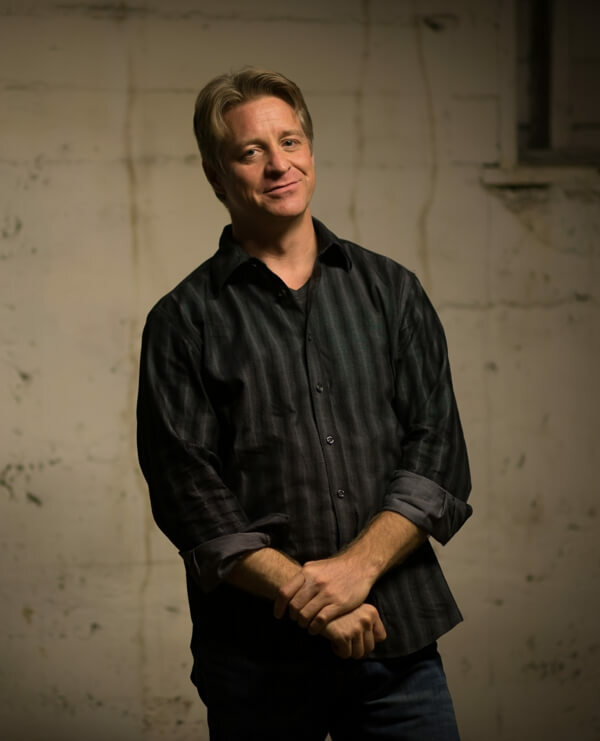 Cameron Powell is a writer, six-time startup entrepreneur, consultant and coach, a largely repentant lawyer, and a semi-pro karaokist. Once upon a time, as a young lawyer, he got to say “Your honor, I represent the United States.” In early childhood pictures there is evidence of his mother committing lederhosen. He is a graduate of the University of Colorado at Boulder and Harvard Law School. A rugged indoorsman, he nevertheless spent the last five years skiing and hiking around Telluride and Boulder, Colorado, and he’s now chosen to live in San Francisco. THE MAKING OF A MOVING MEMOIR ON THE MOTHER-SON BOND. Ordinary Magic covers a particularly dramatic period in my mother's life - and therefore my own. I had a sense, around the time we walked the Camino Francés, in 2011, that I was in the midst of a pretty big real-life story. But, in truth, I didn't know where I was going, in life or the book. After working on the manuscript from early 2012 to late 2014, I ended up throwing out most of what I'd written. It was a different story then. Death changes things. Its manner changes things. Time heals nothing except through our changing interpretations. Ordinary Magic is my interpretation - the story of my mother that I choose. Much of Ordinary Magic consists of a unique look at the mother-son relationship, in real-time -- from our memorable jaunt through Spain to what I call the last camino, both of which were recorded on our blog and little altered in the book. The result is an authentic document of what we went through at the time - unhindered by either the ravaging effects of memory or later, writerly alterations that attempt to "improve" the story while removing the honesty and immediacy of the original. No, Magic has been carefully reconstructed from artifacts as they were at the time, from my three-page autobiography Memoirs of a Forgetful Boyhood (age 9) and my mother's own letters and short stories to the daily, real-time blogging - just as I wrote in my journal as my mother lay dying - that will live perhaps most enduringly in the reader’s heart and imagination. Are you ready to read the PROLOGUE? Or just get in the mood for Camino hilarity with the short film, "A Path With Heart"?